Circuit Dedicated to the 4 times Spanish Campieon of the CM category (mountain races) Pedro Roca, the oficial pilote of Silver Car Prototypes (real car factory) placed in Navarra Spain. and to all that make posible my projects. 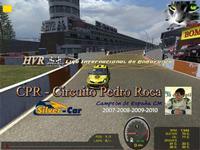 To download this circuit you must be registered in HVR Motorsport - ANEV, Asociacion Navarra de Eventos Virtuales. and go to the Circuits rFactor section. There are currently no setups for PRC Pedro Roca Circuit. Add a Setup.